This week the points values for our games increased to 1250 points. I have to say, this felt like a much more enjoyable points value to play. Our last game at 1000 points made it easy to 6-1 a company as the small companies broke so quickly. 1250 gives enough points for some solid combat platoons and a little bit of support. As we only had four players this week, I played on the Allied side for this game with my 11th Armoured Division. As the 11th. AD was refitting at the start of the Battle of the Bulge, I decided to use a trained list from Overlord to represent the battle weary troops and worn out Shermans (and because it meant I could have some semblance of support platoons!). At the start of the turn, the campaign map showed the Germans forming a solid bulge in the Allied lines but risking being encircled from the rear. In round two the Axis attacked Losheim to protect their flank and the Allies attacked St. Vith in an attempt at surrounding the Axis forces. The games for round two were played with 1250 point forces and we used the mission "Surrounded" (we rolled for a defensive battle for round 2). Sorry there are no pictures of the games, I forgot to take any pictures as my game was so tense! After the catastrophe at Malmedy resulted in the loss of Malmedy and Losheim, the German forces attacked with their most powerful commander, Glen, and his Grenadiers to recapture Losheim. With the Canadians attacking in St. Vith, the defence of Losheim was left up to the battle weary 11th. Armoured Division. The 11th. AD Sherman company surrounded the Grenadiers at Losheim and launched a desperate attack. The German Marders and King Tigers proved decisive as they destroyed all of the Allied Shermans and maintained a tenuous hold on Losheim. With the Axis overextending in Bastogne and Sibret, the Supreme Allied Commander attacked into St. Vith in the hopes of surrounding a pocket of Axis forces. The German Field Marshal committed his own Fallschirmjager company to the defence of St. Vith. As in Losheim, the Axis forces were surrounded from all sides. The unrelenting artillery bombardments of the Allies and the armoured might of the Canadians saw them narrowly defeat the Fallschirmjager. With the victory, the Allied forces captured the city of St. Vith (and it's 50 victory points) and now threaten to surround the Axis forces. With the loss of Losheim and the capture of St. Vith, the Allied forces are now themselves surrounded at St. Vith unless they can capture more ground in the next round. After two rounds of fighting, the results of the campaign so far are a draw. 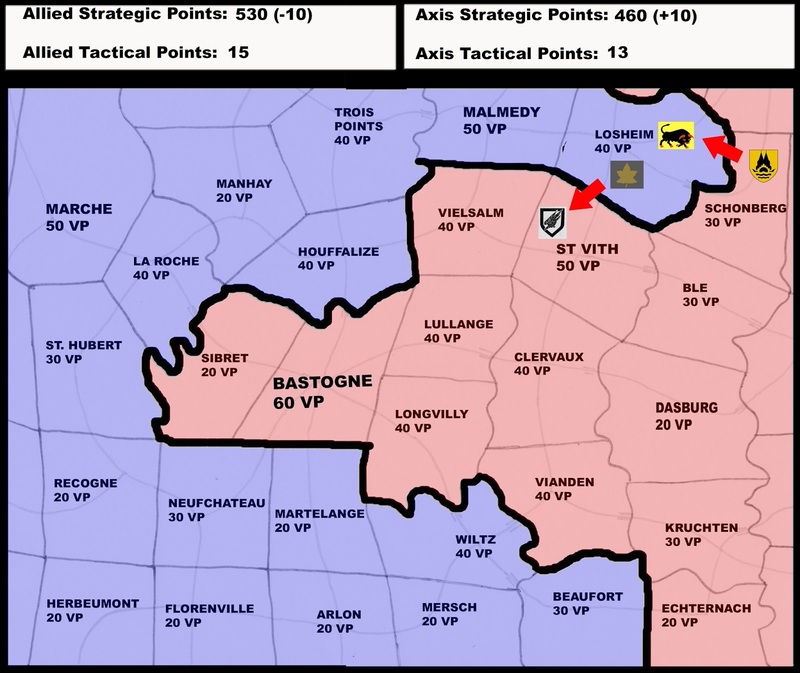 The two sides have both captured and lost the same amount of victory points of territory and are tied in tactical victory points. Both sides are dangerously exposed. The Axis forces around Bastogne are at risk of being surrounded while also having the chance to push into La Roche and Marche (both high victory point locations). The Allied forces are putting pressure on the Axis rear but are risking being over-extended at St. Vith. So far the Allies have weathered the bulk of the German attacks in the early part of the campaign. The teams will be balanced in strategic attacks in the middle portion of the campaign before the Allies have the chance to counterattack in the later stages of the campaign. Next week we should have all of the players present. The Germans will have two attacks in the next round. Check back next week for round 3 updates in our campaign and to see if either side can achieve a strategic or tactical advantage. Your 11th AD would fit right in! I was thinking about running another one in a few months where I get people online to submit games for it. I'd love to get results from all over the place. I'll keep that in mind. There seems to be some interest. This campaign should finish late April and then there is the WWPD campaign and then I may run a little online one in the early summer or late spring, depending on time.